In shorting, the difference between where you sell a stock and where you buy it back is called _____. To find out how I've profited greatly from these difficult market conditions, subscribe to "Kirk Lindstrom's Investment Newsletter" today! 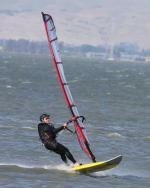 Subscribe TODAY and get the June 2008 issue for FREE! "This month's Consumer Confidence Index is the fifth lowest reading ever. Consumers' assessment of present-day conditions continues to grow more negative and suggests the economy remains stuck in low gear. Looking ahead, consumers' economic outlook is so bleak that the Expectations Index has reached a new all-time low. Perhaps the silver lining to this otherwise dismal report is that Consumer Confidence may be nearing a bottom." This chart, courtesy of MartinCapital, shows Consumer Confidence graphed 30 years back to 1978 can be compared to the chart of the DJIA below back to 1978. The lowest level was in early 1992. 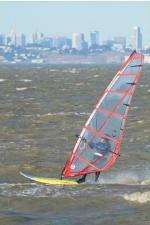 Click charts to see full sized images. Note how 1992 was a great time to buy stocks, especially Citibank (C) which faced similar troubles then as it does now. Here is a chart, courtesy of Henry To of MarketThoughts.com, showing the Conference Board's Consumer Confidence Index and the Dow Jones Industrial Average (More DOW Charts) back to 1981 all on one graph. All the graphs show that the DJIA has made significant gains in the years that follow very low consumer confidence. The question investors are asking now is "Can things continue to get worse or is this a bottom?" The recent plunge in the stock markets indicate investors are little more optimistic about the stock market than consumers are optimistic about the future. I have started to nibble again with funds from profit taking when the markets were higher and may add more given a successful test of the lows. 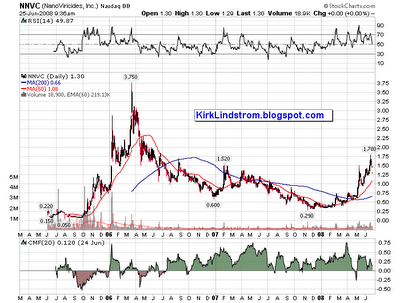 Disclaimer: I purchased Citi (C) for my newsletter "explore portfolio" back in 1998, took profits and traded its volatility over the years for added return when it was up so I am on "house money." I have started to buy shares again but my most recent purchase is in the red. I have a plan to buy more if certain conditions are met. Press Release Source: NanoViricides, Inc.
WEST HAVEN, Conn.: NanoViricides, Inc. (Chart: NNVC.OB), (the “Company”) said that noted Yale University School of Medicine research physician, Thomas Lentz, MD, has agreed to join the NanoViricides’ Scientific Advisory Board (SAB). Professor Lentz’s research has laid the early foundations for developing anti-viral therapies by blocking virus-cell receptor interactions. His work on the binding of rabies virus to the nicotinic acetylcholine receptor has helped in the creation of a rabies-specific nanoviricide. In addition, his extensive studies on the classification of viruses and of their cellular receptors into broad groups provided the basis for the broad-spectrum nanoviricides that the Company is developing at present as potent therapeutics against a large number of viruses. Dr. Lentz, whose current title is Senior Research Scientist and Professor Emeritus of Cell Biology was previously also Associate Dean for Admissions and Financial Aid at the School of Medicine (http://www.cellbiology.yale.edu/cellbio/html/faculty/t_lentz.shtml). NanoViricides, Inc. (www.nanoviricides.com) is a development stage company that is creating special purpose nanomaterials for viral therapy. The Company's novel nanoviricide™ class of drug candidates are designed to specifically attack enveloped virus particles and to dismantle them. The Company is developing drugs against a number of viral diseases including H5N1 bird flu, seasonal influenza, HIV, EKC (epidemic kerato-conjunctivitis or severe pink eye disease), hepatitis C, rabies, dengue fever, and Ebola virus, among others. This press release contains forward-looking statements that reflect the Company's current expectation regarding future events. Forward-looking statements involve risks and uncertainties. Actual events could differ materially and substantially from those projected herein and depend on a number of factors. Certain statements in this release, and other written or oral statements made by NanoViricides, Inc. are “forward-looking statements” within the meaning of Section 27A of the Securities Act of 1933 and Section 21E of the Securities Exchange Act of 1934. These forward looking statements are subject to known and unknown risks, uncertainties and other factors that may cause actual results, performance, or achievements of the company to be different from those expressed or implied including the success of the Company's research and development efforts, the availability of adequate financing, the successful and timely completion of clinical studies and the uncertainties related to the regulatory process, described in the “Management’s Discussion and Analysis” section of the Company’s Form 10-KSB and other reports and filings with the Securities and Exchange Commission. What tool did 17th century rice traders contribute to the financial markets? 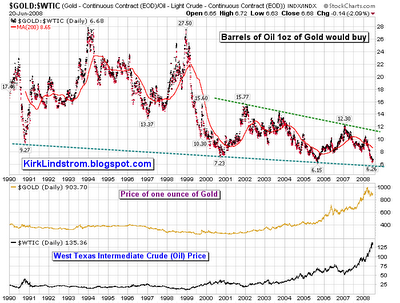 How Many Barrels of Oil Will One Ounce of Gold Buy? Crude Oil Price in Gold: This chart shows the price of oil ($WTIC), the price of gold ($GOLD) and the number of barrels of oil one ounce of gold would buy for dates between January 1990 through today. 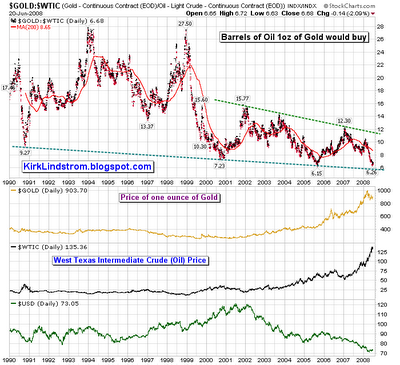 Currently, one ounce of gold will get you 6.68 barrels of oil. I think the chart makes it quite clear why Saudi Arabia and some others think oil is too high. When Bill Clinton was president of the US, one ounce of gold could buy between 7 and 28 barrels of oil with the lowest ratio, 7.23 barrels of oil for one ounce of gold, occurring shortly before his last day in office. It is interesting that during President Bush's term (following Bill Clinton) one ounce of gold bought between 6 and 16 barrels of oil with the lowest number of barrels per ounce in 2005 at 6.15. At today's record high prices for oil, we get slightly more barrels of oil (6.26 vs 6.15) for an ounce of gold! Also of note is the 19 year support line indicates we are near an extreme level again. 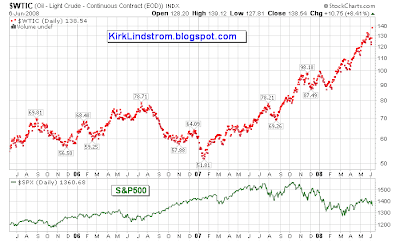 Here is the same chart with the US Dollar ($USD) index added. If the dollar has bottomed and we can make it go up again, perhaps with an energy program that does not send trillions of dollars to OPEC and higher Fed Funds rates, then US consumers could get some relief at the gas pump. Discuss this article at our "Investing for the Long Term" facebook forum called "Energy, Oil prices, Alternative Energy, etc." My "70:30 Explore Portfolio" was up 198.7% or 12.3% compound annual return. My "50:50 Conservative Core Portfolio" was up 72.5% or 6.0% compound annual return. My "80:20 Aggressive Core Portfolio" was up 72.3% or 5.9% compound annual return. VFINX (S&P500) was up 31.7% or 3.0% compound annual return. Vanguard's Money Market Fund was up 38.8% or 3.5% compound annual return. To find out how I've profited greatly from these difficult market conditions over the past decade, subscribe to "Kirk Lindstrom's Investment Newsletter" today! Gasoline prices have nearly doubled in less than a year. That is only half the story. This chart, courtesy of StockCharts.com, shows oil and gasoline prices have more than tripled since January 2005! 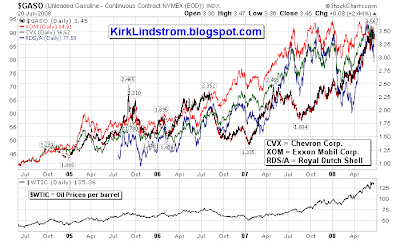 This chart shows that the share prices for the major oil companies have risen right along with the price of energy. Our pain at the pump has been their gain, which may explain the bad feelings towards the oil industry. One reason oil prices have continued to go up despite higher prices that are supposed to lower demand is some countries like China set prices that force their refiners to sell gasoline at a loss. It works out as a government mandated subsidy for consumers and industry. Yesterday China raised fuel prices to curb demand. June 20 (Bloomberg) -- China, the world's second-biggest oil-consuming nation, unexpectedly raised gasoline and diesel prices by at least 17 percent and increased power tariffs to rein in energy use, potentially driving up inflation. The record price increase, the first since November, may ease refining losses at China Petroleum & Chemical Corp. and PetroChina Co., who have been forced to sell fuels below cost. The companies' shares rose in Hong Kong trading. This chart, courtesy of StockCharts.com, shows oil and S&P500 prices. This chart, courtesy of Chart of the Day, shows gasoline prices adjusted for inflation. After adjusting for inflation, gasoline prices are at record highs that are 18% above the old inflation-adjusted peak of 1981! 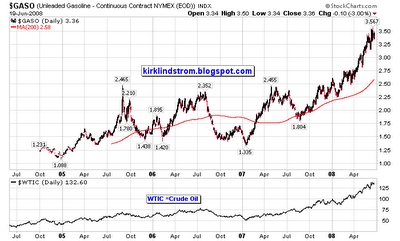 Gasoline prices are above a trend channel (see red line) that has been in existence since early 2000. Large spikes in oil prices are often followed by recessions. The days of cheap energy are probably gone but as major users of gasoline, such as China, allow prices consumers pay to go up, we should get some relief from the relentless price hikes for energy. Bubbles: Nasdaq vs. Homebuilders vs. Oil? Somebody posted this chart with no attribution in a forum I read. 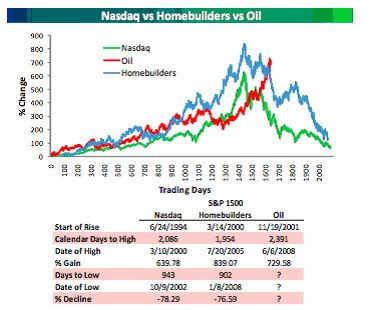 It compares the price percent change over time for the NASDAQ, homebuilders and Oil. We know with 20:20 hindsight that the Nasdaq and homebuilder stocks were in a bubble that popped with a huge bang. Will oil suffer the same fate allowing soccer moms to shuttle their kids to and from school in big SUVs again? I think not but I better on oil continuing to go higher and higher is a dangerous game. When will the bubble burst ... or will it. Nearly two months ago I wrote a column asking "Is Oil Becoming the 'Mother of All Bubbles.'" Personally, I don't think it is. Even though oil has since hit several new records, some bubbles are just hard to beat. We all know how the famous Dutch tulip bulb mania ended. Fortunes were lost. Thousands of Dutchmen ended up financially ruined. In 1720, an English firm - the South Sea Company - was granted a monopoly to trade with South America under a treaty with Spain. The primary product? West Africans sold into slavery. This seemed like such a good deal - even though the company made little actual profit - that shares rose more than ten-fold in a single year. When Sir Isaac Newton was asked how high South Sea stock might eventually go, he replied, "I can calculate the motion of heavenly bodies, but not the madness of people." Good answer. The stock soon collapsed and thousands of investors were wiped out. With these classic bubbles in mind, let's take a dispassionate look at today's oil market. There is a disconnect when supply goes up, demand goes down and prices continue higher. This often happens in the late stages of a bubble where higher prices are what cause higher prices as people find ways to fool themselves into jumping in just before a crash. Oil demand in the United States is actually down 2% so far this year. According to the federal Energy Information Administration, high prices and a weak economy will knock down U.S. oil consumption by 90,000 barrels a day in 2008. 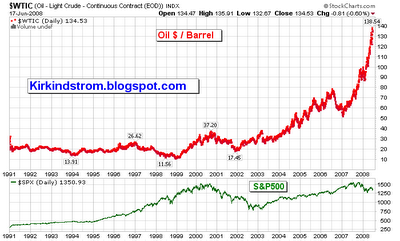 Chart of Oil Prices has gone "parabolic." Yet despite these decidedly bearish developments for oil, the price is up 51% since January 1 - and more than 700% since trading at $17.45 a barrel in November 2001. Some will argue that this price rise is fully justified. After all, most of the world's major oil deposits have already been discovered. The low-hanging fruit has been picked. The remaining oil supplies are tough to get at - and expensive to recover. Meanwhile, the world's demand for oil keeps rising as more people around the globe - especially in emerging giants like India and China - pound the table for "more juice." This story is essentially correct. But it is just a story - and a thoroughly well-known one at that. It is not a rationale to buy oil today. Especially since high prices always sow the seeds of their own collapse. Consumers start to conserve. Producers search for oil that was once too costly to extract. Supply and demand come back into balance. According to Stephen Schork, President of Schork Group, a firm that advises the Organization of Petroleum Exporting Countries, "There's nothing different between this mania, the dot-com mania, the real estate mania, the Dow Jones mania of the 1920s, the South Sea bubble and the Dutch tulip-bulb mania. History repeats itself over and over and over again." This is probably the reason OPEC is not spending large sums of money to increase supply. They are much better off to get all they can for their oil before the bubble crashes. Why spend a fortune to increase capacity that comes on line as soon as the US switches to hybrid or plug-in electric cars charged by nuclear power plants at night. Yes, speculative fever has gripped the oil market. This bull is likely to end up just like those in the ring in Mexico City. Current oil prices are simply unsustainable. That doesn't mean that oil is going to plunge today or tomorrow. Indeed, it could keep rising for quite some time. After all, you cannot make a rational judgment about when irrational behavior will end. But oil prices will come back down. And that will be positive for both the economy and the stock market. Of course, history never repeats itself exactly the same way. We may not be at the exact inflection point. But ask yourself this: If Isaac Newton were around, would he be buying oil today? Think about that. And govern yourself accordingly. It seems like good advice to me. A series of higher highs and higher lows signals what kind of trend? If this bottom is in, then I suspect semiconductor stocks (at least the ones in my explore portfolio) will continue to lead the markets on the way up to new highs just like they did in 1999 when my explore portfolio gained 117% and 2003 when it gained 77%. Semiconductor and technology stocks in general will do well in an environment of slow growth, higher than typical inflation and high energy prices. Why? Companies will spend money to be more productive with technology. In uncertain times, it is better to spend on technology than new hires since you don't have to take charges for laying people off if the economy gets worse rather than better. Companies will drill for natural gas in India so the Indian government can keep dollars for energy in India rather than send them to OPEC as we do in the USA. Replace jet airplanes with more fuel efficient models with the latest engine technology. People will look for lower priced alternatives to expensive travel. Perhaps they will buy new TVs to watch NASCAR in High Definition rather than spend a fortune on gasoline to see the event live without instant replay and camera shots from inside the cars. People will also stay at home and spend on new HDTV sets rather than take long trips to watch NASCAR and other events. Regular TVs will not work without a special converter box after broadcasters switch to digital next year unless. I suspect the investment banks are accumulating the semiconductor related stocks I recommend now so they can "sell the story" next year just like they did in 1999 to “sell the Y2K new” where people bought new computers ahead of schedule to be ready for a possible “Y2K bug.” Like in 1999, I suspect the volume of new TV sets will soar as many will buy a new high definition TV set rather than use a converter box with their old TV. SOX Chart: Dips below the dashed blue line to the dashed green line have been exceptional buying opportunities for the Semiconductor Index ($SOX). I have taken some profits in my biggest gainer (UTEK) as we tested the dash blue line from below just before the recent market weakness. I suspect some of my other favorite "trading stocks" in the newsletter (stocks like Agilent, Altera, AMAT,Intel, LRCX, MSFT , Verigy, etc.) will hit my targeted buy levels for further accumulation if the SOX tests the dash green line like it did in 2003 after making a low in October 2002. But I would not be surprised if the SOX soared without a retest like it did in 1998 just after I loaded up my explore portfolio with my favorite semiconductor stocks. Chart of the Day shows the latest decline that began in May for the DJIA is getting close to testing the green support line. 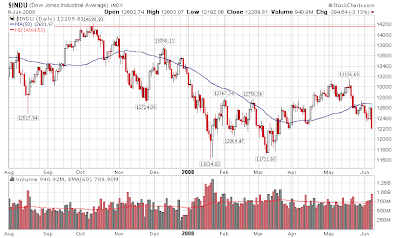 My longer term DJIA chart below provides even more insight. During the last bear market, the markets bottomed in October 2002 then rallied significantly before making a "higher low triple bottom" in March 2003. 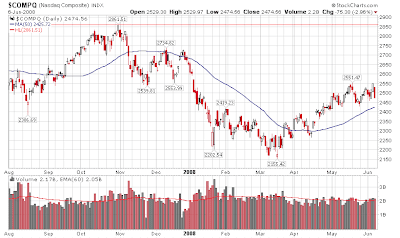 After a 20.2% decline from the high to the low in the S&P500 on an intraday basis, we could be seeing the same thing now with this current correction after the recent return of the DJIA to above 13,000. 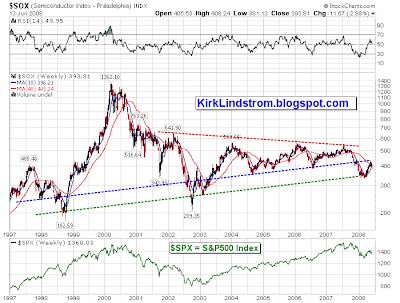 For discussion of the SOX index, see "Grab your SOX, Semiconductor Stocks Ready to Soar." These are the Best Unpublished CD Rates and terms at Wachovia Bank that they offer as a "last resort" to keep or get your business. Wachovia spends money to get new customers. Wachovia will also spend money to keep the smart ones too by giving us their best, unpublished rates. The day your CD matures, call the number they give on the "Automatic Renewal Notice" and say you want to take your money to a better paying bank we list on our Highest CD Rates page. This should get you their best rates to keep your money. Print out the CD rates shown on our Highest CD Rates page before you call so you can quote specifics. Call and them you want to close your CD that just rolled over into a low rate. Wachovia usually gets new customers with great CD "teaser rates" that they automatically roll over into a CD that pays a much lower rate at the end of the teaser term. You don't have to take what they give you! You CAN get a much better rate. Investors looking for stocks priced less than intrinsic value are referred to as ______ investors. The markets gave back much of their gains on Friday as oil prices and unemployment surged. Crude Oil futures finished the up $10.75, or 8.8%, at $138.54 after a government official in Israel said would have to attack Iran if diplomatic efforts failed to halt Iran's nuclear bomb program. Today Israeli officials dismissed Transportation Minister Shaul Mofaz's threat of military action against Iran, stressing that the hawkish remarks do not represent Israel's policy. The US unemployment rate gained half a percentage point to 5.5% in May, its highest level since October 2004 and biggest one-month increase in 22 years. This means the correction from high to low has been 20.2% and the S&P500 is currently 13.7% off the peak. This means the correction from high to low has been 19.4% and the DJIA is currently 14.5% off the peak. This means the correction from high to low has been 24.7% and the NASDAQ Composite is currently 13.5% off the peak. To see what my monthly newsletter sentiment update looks like, check out this PDF file: "Take Profits & Sell Sentiment Indicators Near The Market Top." 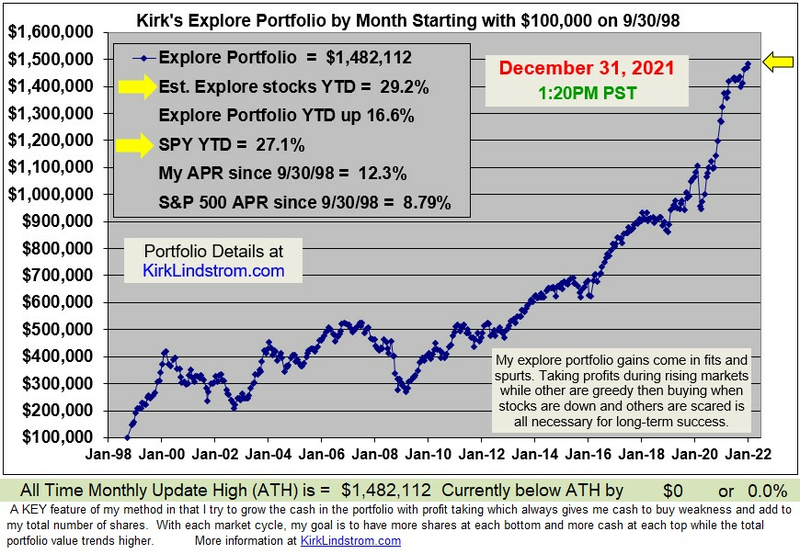 That page of my newsletter is from last year with the markets near an all time high at 1540.